When I go to potlucks, I tend to make brownies. Or pie. Or tarts. Or…you get the idea. I like being the one who brought the thing made of sugar and chocolate. It’s a cheaters way of getting people to like you. But last week I went and the request was, “Vegetables.” Well, I can help with that. Technically, our CSA is over. There was no delivery last week. Never fear, though, because we’re addicts. We signed up for the winter share, and we’re going to pre-register for next year. 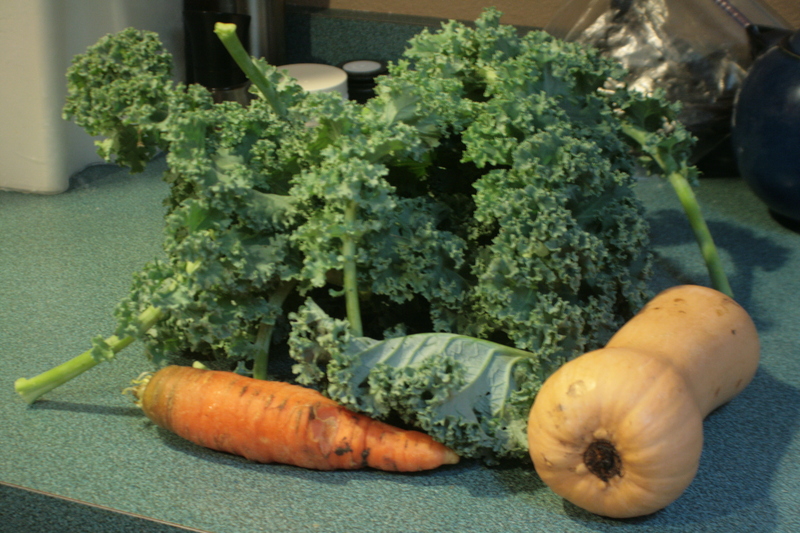 The vegetable onslaught has been, to put it mildly, a roaring success. So that kale isn’t actually CSA kale, it’s “Are you just going to leave that kale in your back yard and not do anything with it?” kale I rescued from a friend. I figured that since we didn’t have a CSA delivery last week I could do that without my roommates murdering me. I’m still alive, so I think I was right. 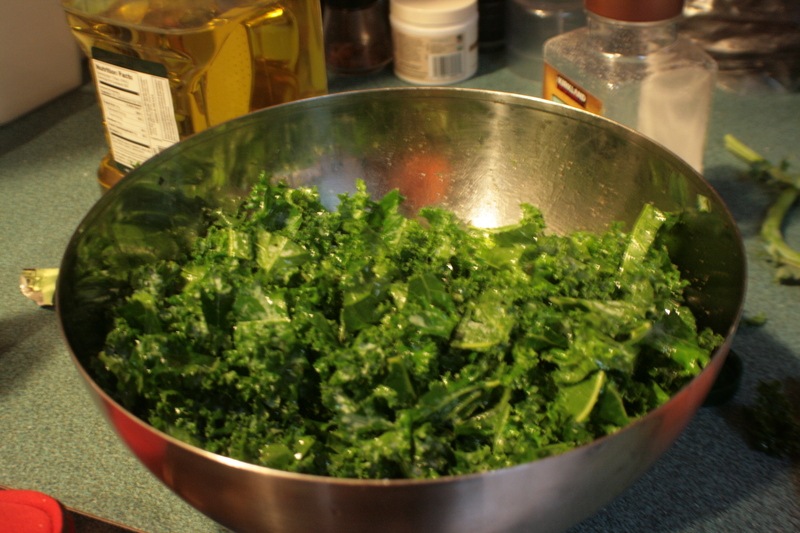 I knew I was going to do some sort of warm salad because kale is just too sassy tough to eat raw. And I knew I wanted to put squash on it because squash. So far this year we’ve braised squash, mashed it, roasted it, curried it, and souped it. 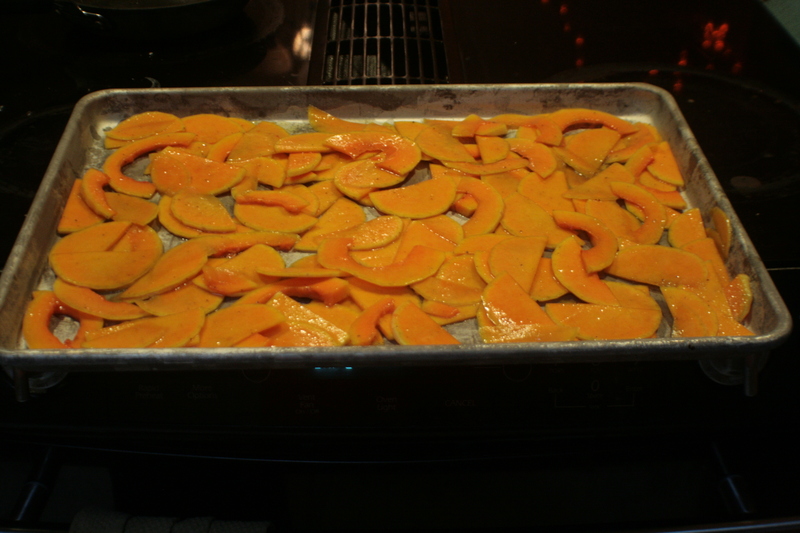 I decided to see if I could make squash chips. 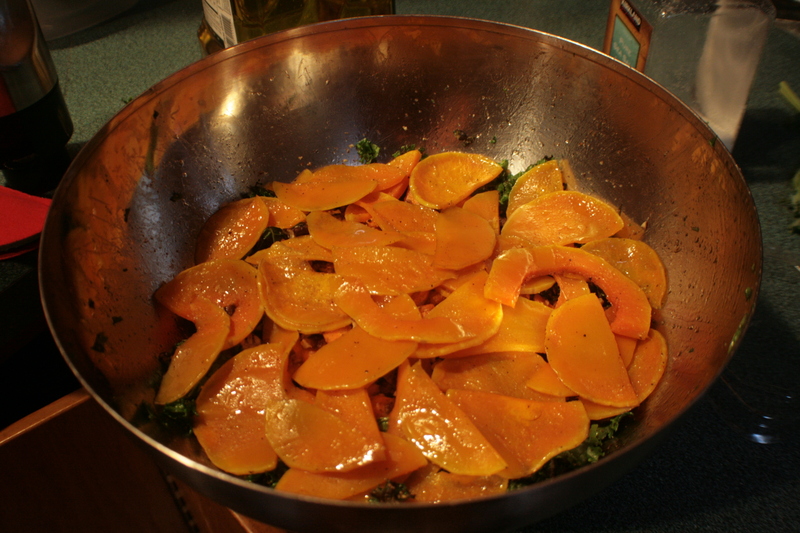 I sliced as thinly as I could, tossed them with olive oil and some salt, then slapped them in a very hot oven. 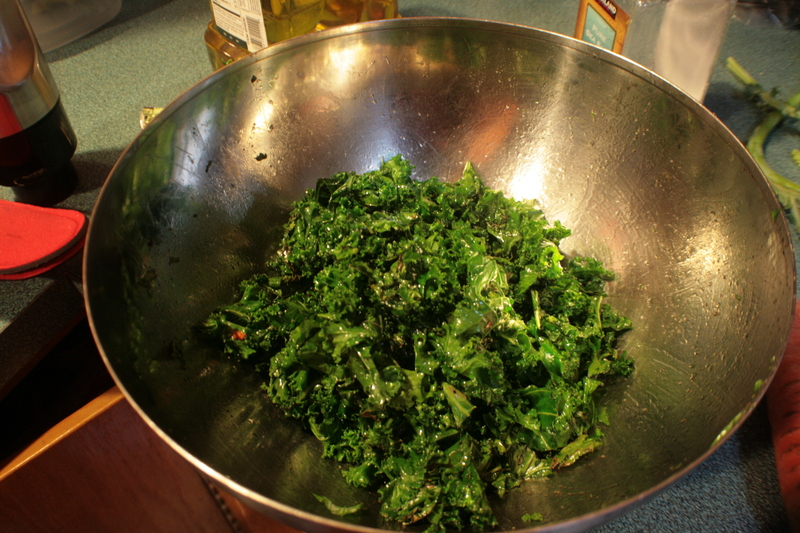 That’s all the kale chopped up and tossed with oil. 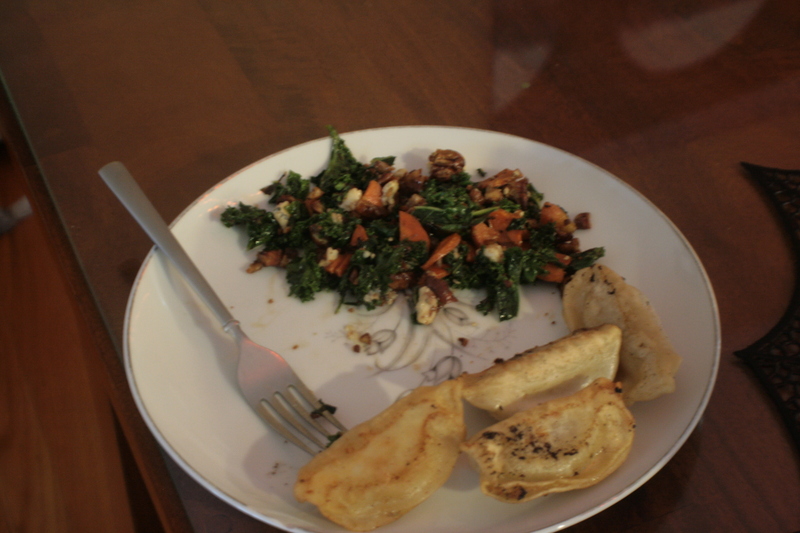 And that’s what it looked like after I sauteed it. Cooks down a bit, yes? 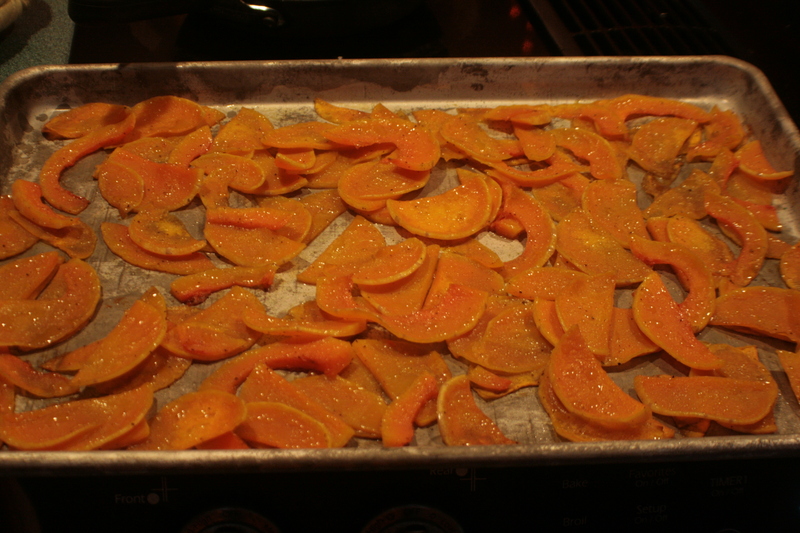 The squash came out quite tasty. It wasn’t chips, but they got super sweet and tasted like, of all things, apple. No complaints here. 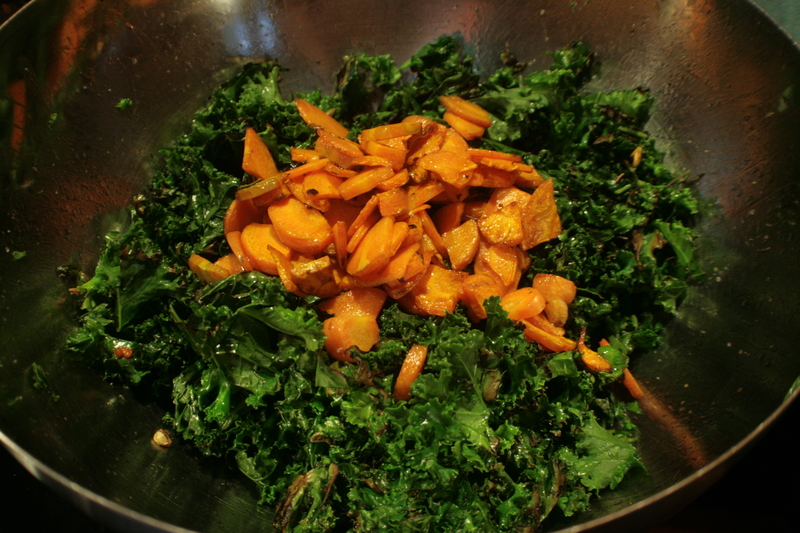 Since everything else was getting a trip through some oil and heat, I went ahead and sauteed the carrots, too. And then I pulled out some old candied pecans we’ve had in the pantry forever and needed to use, chopped them up, and tossed them in. Just because I was bringing the vegetables did not mean that I couldn’t bring sweets. I’m not really the person to go to for expert salad construction. I wind up just piling everything in, then stirring and hoping the good bits don’t clump at the bottom. Some day I’ll develop an advanced technique that is awesome. Then I’ll take over the world. 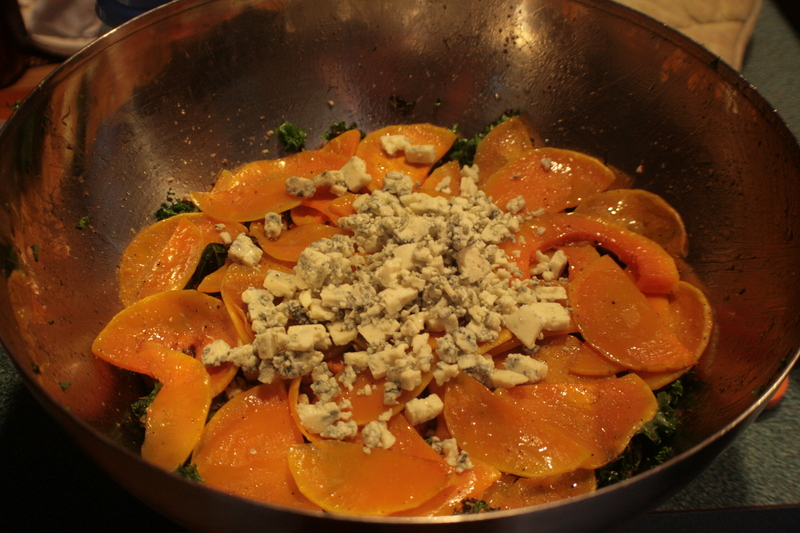 Blue cheese, because blue cheese is awesome on everything, especially warm salads, especially warm salads with apple flavors and pecans. I mixed up a dressing out of sriracha, a nice vinegar, a bit of soy sauce and some lemon juice. Then I tossed it on at the party and did my stirring. It was good. People seemed to like it. I liked it. It was consumed in quantity, but I managed to snag leftovers. Which I promptly ate for lunch the next day. Recommended.